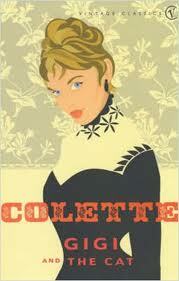 I can’t believe I had never heard of Colette until a couple of months ago! Of course I recognised the film posters for the musical of Gigi, but had never seen it and wasn’t even aware that it was based on a book. I feel as though I have been living on another planet! As soon as I read this review of The Cat at Literary Relish, I knew I had to give Colette a go. This is the second book that I have read for the Pay It Sideways Challenge. This book is made up of two short stories and is the perfect introduction to this brand spanking new (for me, anyway) author. In a short amount of pages, Colette manages to show off her power over the written word. She sets the scene, creates an atmosphere and then whisks you through bizarre situations with some witty dialogue to keep things interesting. The dialogue in Gigi is particularly important. Young and excitable Gilberte, known as Gigi, is being trained by her grandmother and aunt in the art of seduction. The contrast between these characters is what makes the dialogue so amusing, and gives a lighthearted feel to the novella. But there is still a slight whiff of seediness and an unpleasant undertone. Enter Gaston Lachaille, a rich and bland family friend in his thirties who has known Gigi for years. Charmed by Gigi’s fresh and childish confidence, he begins to see her in a new light. But Gigi is not interested in the life of a courtesan and does not want to be used and thrown away by Gaston, like countless other women. She refuses to go along with all the plans that have been laid out for her. I can’t work out whether Gigi’s character is more calculating than the reader realises, or whether she is an honest romantic, but there is something about her that I like. Her character makes me smile with her lively outbursts and silly remarks. And it is always good to have a headstrong female in literature! The second, longer novella in the book is the one that first got my attention. I am a huge cat lover and always prick up my ears when I hear about something cat related. Simply named The Cat, this story is about a strange love triangle between Alain, his new wife Camille and Saha, his beautiful Russian Blue. Like Gigi, I thought this was going to be an amusing novella, but I actually found it slightly disturbing, although still entertaining. Alain is an only child and feels safe and happy within his little world at his childhood home. He has a special bond with his cat, who loves him very much and ‘understands’ him. But when he marries Camille, the passionate, modern young woman, Alain can’t adjust to life in a small, ninth floor apartment without his Saha. Any other man would feel lucky to have such a demonstrative, good looking woman in his bed every night, but Alain only finds her inappropriate and resents her obvious desires. The prudish thoughts that often run through Alain’s head when Camille is walking around the apartment naked or staring sensually into his eyes are bordering on hilarious, but they also make me feel sad. Poor Alain is in a loveless marriage and can’t stand his wife but most all he misses Saha and can’t love anyone else. If you enjoy quirky, unusual love stories, odd characters and brilliant writing, then this is a collection that you should definitely read! Especially if you are a fan of our furry feline friends. Thanks for the mention 🙂 ! I’m so glad you enjoyed these two stories. I love cats like yourself and thought ‘La Chatte’ was such a unusual story and described a very special relationship just perfectly. If you liked Colette you MUST read ‘Chéri’ next! Yes, I’ve already put it on my wish list! Thanks for introducing me to Colette! Great review and I thinks its time to pick up the old penguin paperback of Gigi that sits on my shelf to have a read. It contains both novellas, if only Gigi makes it to the front. Thanks! Hope you enjoy your re-read! I imagine it is the sort of thing you can re-read and pick up new things to love about it! That’s great! Would love to know what you think of it! Fantastic! I have loved the musical Gigi for several years, ever since I was old enough to truly understand the social undertones, haha. Every time I watch it I see Colette’s name roll by in the credits and think, “I must read the original story”, and then it always slips my mind. Gigi the musical is also one of the films I used to convince my husband that musicals are wonderful and lots of fun (how could people not love them? ), and the book might be fun for us to read together. Colette’s works seem as if they would make great “conversation pieces”. Yes, both Gigi and The Cat make great ‘conversation pieces’. After reading other reviews, it is really interesting to see what people take away from these novellas – especially Gigi.There is a whole range of different opinions! I look forward to seeing the musical! I have to be in the mood for a musical, but when I’m in the right frame of mind, I love them! I was young when I first watched Gigi with Leslie Caron, Maurice Chevalier and Louis Jourdan. I loved it, but I always felt like I was missing something. In fact, I was missing something. 🙂 I thought that Gigi’s lessons with her grandmother were just ordinary lessons in manners. There was the obvious romantic relationship between Gigi and Gaston, and then there was that underlying (and dare I say unrespectable) sexual relationship that Gigi was being groomed for. I would love to pick up this book and see how the author writes the novella. Thanks for the review! I hope you do read it! I now have to look out for other books by Colette. I’ve never seen Gigi, but will have to change that soon! Of course I don’t mind! I’ll take a look now and see what else you have on there!